Think Weasel! 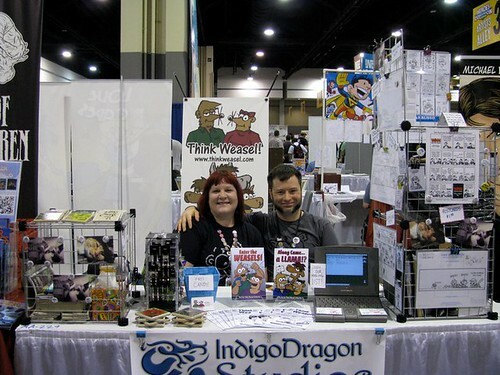 : Combining Comics & Crafts | "I'm Not The Artist"
Heroes Con in Charlotte NC, Wizard Atlanta, Atlanta Comic Con, ConNooga, Knoxville Comic and Anime Con and we distribute freebies at DragonCon. We also attend Phoenix Comic Con, SDCC, WonderCon and APE when we can afford it. What is your role? To what degree do you provide creative input? Do you attend every convention? My role is best described as Weasel Wrangler, which is what it says on my card. 🙂 I am the Editor, dialog coach and sometimes layout coach. I also help come up with ideas and characters. Yes, we attend conventions together. It really takes two to be at a table all day. Not often, since I usually have some of my crafty earrings and such at the table, too. If they want a sketch or something signed, they are happy to come back if Nick is away for a minute. Well, we’re definitely more dynamic as a team than by ourselves. Our personalities complement one another and we work together very well. We’ve always been thick as thieves, so this is more of the same. What do you do besides helping out? Do you have a day job or other hobbies? I do not have a day job, but I do graphic design and web design as a freelancer. I’ve been a Mac nerd since 1995. I used to do tech support, but I’ve gotten away from that in recent years. Nick is more of the tech nerd these days. I do have various crafty hobbies and an Etsy shop. I can’t draw (as you can see from the illustration! ), but I like making things. I make art windows with paint & collage, I make earrings and bracelets with unique and vintage beads and I hope to restart my silversmithing in the near future. I’m also an avid birder and I take photos of birds and flowers for my tile photo coasters on Etsy. 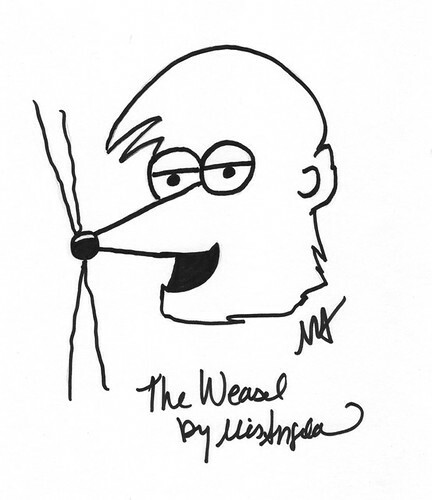 (For Think Weasel!) I do story and character development, and editing and proofing. I also keep Project Wonderful going and do much of the marketing and logistics. I try to keep my eyes open to opportunities such as this one to get our name out there more. Are there any couples who you regularly see at conventions that you look up to? Oh, yes! James and Rebecca Hicks of Little Vampires, Mike and Jen Maihack of Cleopatra in Space, Daniel and Dawna Davis of Steam Crow and Ted Naifeh and Kelly Crumrin of Courtney Crumrin. There are SO many couple teams out there! It’s nice to have such a big community for support. I really love the initial setup of the table and the reaction of the first people in the door. It’s so much fun! Is there one thing you absolutely dread working at comic cons? Yes! No phone reception! Second to that is finding FOOD. Always a challenge. Did you read comics before you met your significant other? If so, what did you read? No, I did not. Nick took me to a Free Comic Book Day and my first reads were Courtney Crumrin and Owly. My first purchased comics were the Angela series (offshoot of Spawn). Now I think my pull list is longer than his!